Subsequent to our return and equipped with a selection of samples I contacted the revered expert for lichens Dr. Harrie Sipman from the Botanical Museum of Freie Universität Berlin. From him I learned, that our fruticose lichen belonged to the species Ramalina maciformis. A desert species native from the Negeb and the Yemen to the eastern Canary Islands. The plant grows, depending on the availability of dew or fog which serves as the predominant moisture-source, very slowly and reaches maximum ages of several decades. Because the lichen does not attach to a substrate in adult age but grows where a spore germinates, this meant that our meteorite would have a terrestrial age of several years at least, decades perhaps. After diligent documentation of our find, which took us until the early evening, Pjotr lifted the first fragment off the soil. It wasn’t until then that I first wondered whether the fall really had occurred only weeks or months prior to our arrival on the Amwizirat. The imprint the meteorite had left in the soil was as hard as concrete hard. The 130 g fragment had sunk into the soil a little more than an inch. Subsequently soluble minerals, mainly calcium carbonates which leached from the soil, had hardened and re-cemented together again the fine grained silt. It was difficult to say how much time it had taken for the cementing to develop. I had my doubts that days or weeks were sufficient for the process. While the other members of our party searched the surrounding terrain to a hundred yards, Roger took care of the initial find and probable impact site. Roger, a precision mechanic by profession, had a concept of thoroughness which operated in the micrometer range. And with this approach he searched the ground surrounding the find sites square inch by square inch. Shortly before the fading light prevented further work he beckoned to us triumphantly. Beaming with delight he showed us a handful of tiny fragments which on closer inspection, revealed themselves as fragments of the achondrite. Instantly we kneeled on the ground and joined him picking up smallest pieces of the meteorite, some of which showed patches of fusion crust. Due to his Swiss thoroughness he had been able to locate another twenty grams that way. The find spot of the micro debris, which also marked the impact point, together with the two points where the fragments were found, formed a triangle with a leg length of roughly four meters. Studio photo of the eucrite and its lichen. 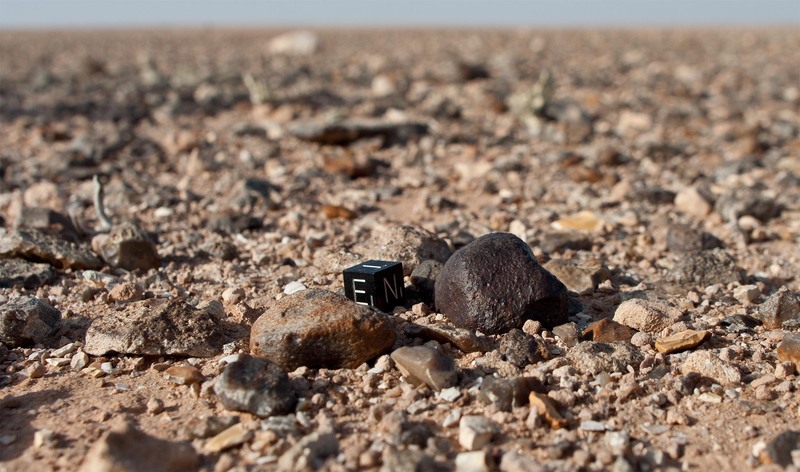 The new Meteorite dense concentration area (DCA) discovered by our Team was named Bou Kra by the Nomenclature Committee of the Meteoritical Society. Our 1st find was classified as monomict eucrite with low shock and weathering degree and later published as Bou Kra 004 (numbering followed publication sequence). With the rising full moon we reached the campsite at the edge of the canyon we had chosen about a mile north of the find location. We pitched our tents and unpacked most of our equipment for a homely setup with the intention to stay the next few days at that site. To celebrate the occasion, Marc conjured a multi-course dinner menu which we rounded off with the usual bottle of Gerrouane at the blazing bonfire. Pjotr was the hero of the day. The chances that our first find after six days of unsuccessful search would be an achondrite were about five percent. And the prospects that, at the same time, our first find would also represent a very recent fall were astronomically low. And yet he had made this find. Pjotr, visibly delighted, took the occasion to entertain us with a little anecdote from the Kainsaz strewnfield in Tartarstan. During one of his countless expeditions to search for fragments of the Kainsaz meteorite, a carbonaceous chondrite which fell in the impenetrable forests of Tartarstan in 1937, he had met an old acquaintance. This man, to the time of their encounter, had already been several weeks at the site. He had searched fruitlessly. Pjotr and his friend discussed their equipment, and this man demonstrated his metal detector which he had designed and assembled himself. Pjotr, permanently interested in things technical, examined the device diligently. He came to the conclusion that this detector was probably the best he had seen, and certainly better than the off-the-rack metal detector which he was using. The search depth of the home-made device was amazing and Pjotr admitted the engineering talent of his acquaintance. Naturally, also the chances to find one of the few Kainsaz meteorites scattered far and wide, were discussed. In the process Pjotr’s friend held the view, that persistence and his superior technology alone would inevitably lead to success, be it sooner or later. But Pjotr had to slightly disagree. There was a certain ingredient that was necessary, and without which success on this strewnfield would not be possible, Pjotr explained to his astonished acquaintance. “And what would this secret ingredient be?” his acquaintance inquired curiously. “Fortune”, Pjotr replied calmly. “Nonsense!” the man declared. He didn’t want to have any of this superstitious nonsense. He didn’t believe in mumbo-jumbo, he lived in an enlightened era, this he made clear. He would simply stay until he would find a meteorite, period. In the end, Pjotr would have to acknowledge the technical advantage of his equipment and the superiority of the latter’s approach. The two said goodbye to each other, but not without the prior agreement to stay in touch and inform each other after their return to civilization about the outcome of their search. And so Pjotr’s friend disappeared again into the forest from which he had emerged, while Pjotr and his assistant continued to search at the spot. And indeed, what no one had expected, happened. Only minutes after his friend had left, Pjotr’s assistant, at a spot only meters from where their conversation had taken place, found a breathtaking Kainsaz meteorite of several hundred grams. Immediately after his return to Moscow and as agreed upon, Pjotr contacted his friend. Contrary to his expectations his search had been unsuccessful, he told Pjotr. Pjotr instead told him about his spectacular find only a few meters from the spot where they had met, but his acquaintance was so baffled that Pjotr received no response from him. The next morning we got up a little later than usual. Marc and I were enjoying an extended breakfast, when suddenly a strange figure staggered into our field of view. The apparition turned out as Roger’s tent, including its hooded owner. Apparently part of the mechanism jammed and could only be repaired by complicated movements brought to effect from within the structure. With interest Marc and I followed the presentation. The two legs projecting from the peaked and dancing superstructure reminded me of an exotic picture. At first it didn’t come into my mind of exactly what the Swiss Dances with Tents reminded me. It was not until an accidental glance at Marc’s breakfast knife sticking in the bread before me that the scales fell from my eyes. It was a jack-knife of French colonial times, and in its steel handle a Douk-Douk was engraved. The dancing medicine man from Papua New Guinea in his cone-shaped bast costume bore a remarkable resemblance to the performance displayed before us. After the Douk-Douk had successfully completed its incantations we were ready to depart for the day’s work. And as if his anecdote of the previous night needed another practical demonstration, Pjotr was already about to prepare for the next strike. Before we would continue our search, we had planned to drive to El Aaiún in order to resupply with diesel, water and food. Because one way was about 140 kilometers we would transit the Dayet Hamada without spending time for closer searching. Unfortunately, we didn’t get that far. We had just climbed the slope and rolled less than a minute on the plateau when Pjotr called out “stop!” and I hit the brakes. 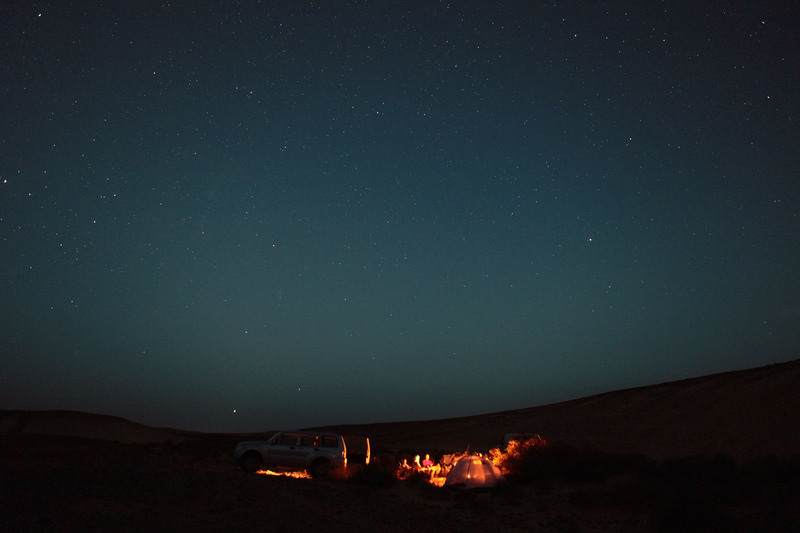 Without a comment he got out of the car, walked a few steps and calmly announced that he had found another meteorite. This was creepy. I joined him disbelievingly and bent down to his find. And indeed, Pjotr had just found the second meteorite of the trip. And that, not even 800 yards from the site of the previous day’s find. The small rock was not easy to recognize as a meteorite. Not even if one stood directly before it. Its chestnut colored surface only differed about nuances from the surrounding sandstone pebbles. 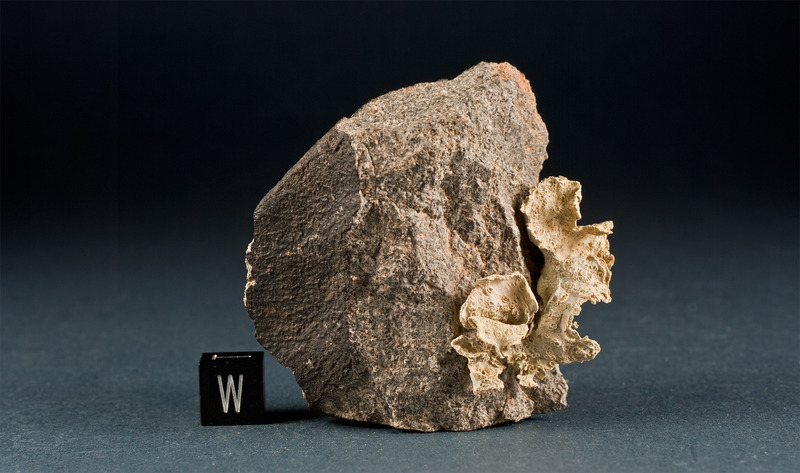 The 38 g meteorite, an ordinary chondrite, showed moderate signs of weathering which spoke for an already considerable terrestrial lifespan. A progressed smoothing of the formerly velvet textured fusion crust as well as a matte shimmering patina suggested a fall event in prehistoric times. Anyway, it was a complete individual with beautifully curved edges, and definitively not paired with yesterday’s achondrite finds. There was nothing particularly spectacular about the small inconspicuous rock, apart from the fact that it came from a 4.5 billion year-old chunk of rock floating in deep space. But the fact, that this was already the second find by one and the same person on this so thoroughly searched plain seemed remarkable to me. We documented the new meteorite find according to our protocol, and after that we spent another hour to search the closer surroundings on foot. Later in the afternoon we would return, assign search grids to each car and comb the plain – again. The drive to the provincial capital El Aaiún passed uneventful. 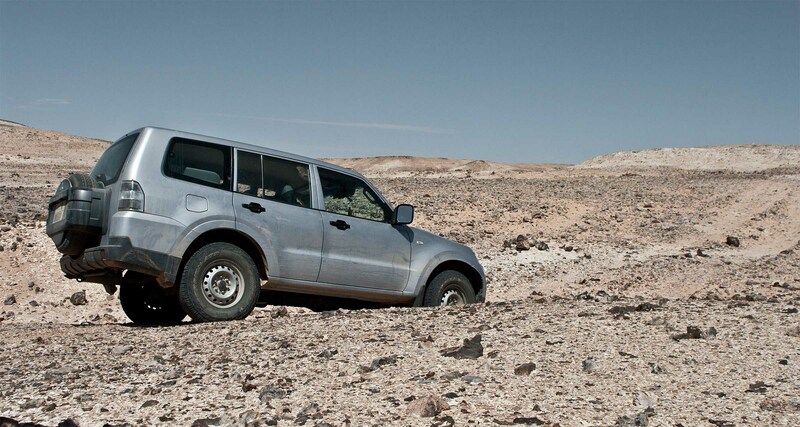 Approximately forty kilometers south-west of our camp ran the asphalt road Smara-El Aaiún. It took us less than an hour to reach the chain of telephone poles running parallel to the road. On our way we passed along the endless conveyor belt transporting the phosphate mined at Bou Craa to the port of El Aaiún. Its strategic importance to the region was underlined by the numerous military compounds, emplacements and radio masts along its course. Following our arrival in the city we stocked up on fresh supplies at the local general store. After a hearty lunch and a brief stop at the gas station we hit the road again. On our way back into the desert we met a lonesome walker trudging under the merciless midday sun on the desolate road towards the city. Upon our question, if he needed help he laughed and asked for a cigarette. With a box of smokes, two bottles of water, a bag of canned tuna he very happily continued along his path. Shortly before reaching a little hamlet we passed a giant heap of concertina wire which was piled up beside the road with the evident purpose of catching the abundantly flying plastic bags and impaling them on its rusty barbs. The hamlet with the well-known name of Itqiy consisted of a not so very inviting snack bar and several trash filled shags and bunkers. We passed through and half an hour later our little convoy turned off the road and back onto the Hamada again. Six kilometers ahead of the achondrite find site we parted and each team started to work on its respective search grid. Until dusk we followed search tracks contrary to the course of the sun which lead us farther to the northeast. The fact that we did not find another meteorite this day did not affect us at all. After all Pjotr had already raised our daily score in the morning. Towards the evening at first our Swiss friends were the first to be forced to acknowledge that compliance with hygiene guidelines during the preparation of the chicken we had enjoyed in El Aaiún probably had not been taken very seriously. Already during the night an acute acceleration of digestion occurred, which could not be controlled even with a heavy dosage of charcoal tablets. In the evening I still had suggested to exile the Swiss into a quarantine camp on the Hamada and leave them to their fate. But my wisecracking soon left me when Pjotr and I were affected in the morning as well. There wasn’t much we could do about it since we had work to do, even with green faces and frequent interruptions. 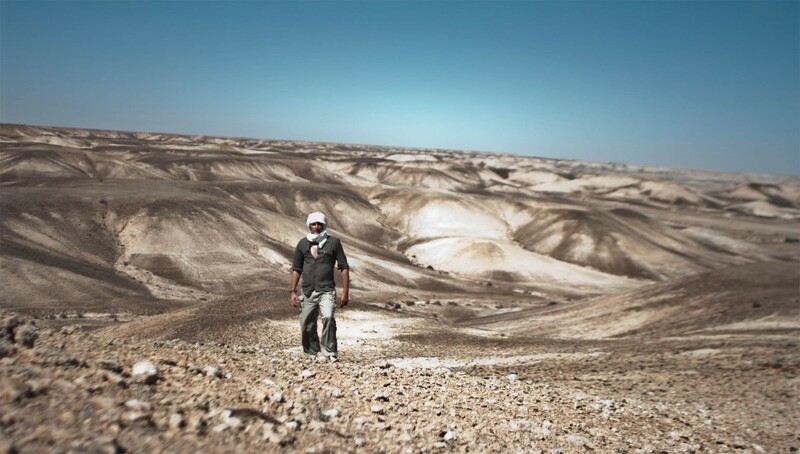 Until noon we searched the G’idat Amwizirat up to a distance of twelve kilometers west and southwest of our find sites. All through the morning we worked on the flat Hamada. Then we decided to expand our search also into the labyrinthine maze of canyons and Queds originating from the edge of the plateau and leading north to the lower Qued of the Saquia. Soon the descent, which was rather an uncontrolled slide, down the forty yard steep slope demanded utmost concentration. Our progress north along narrow ridges and across fields of razor-sharp flint debris was slow and exhausting. Repeatedly we traversed meter deep gullies. Because they were located not far from our course we had chosen the find coordinates of NWA 733 as a reference and meeting point. In the Meteoritical Bulletin database this site is described as “a flat dry desert plain”. When we arrived there we had our doubts if the correspondent who submitted this description had really meant this gully-intersected, rutted valley. Dry it was, indeed, that much we could confirm. The sharp-edged flint had cost us another tire. Already in Smara already, and also later on the Amwizirat, we had been forced to carry out repairs. To fix the punctures, the resourceful Swiss applied a poison-green panacea which was injected into the tubeless tire with the help of the little but powerful compressor we carried. It took Marc half an hour of work and a couple of tightly driven circles to dispense the liquid in the tire before we were ready to go again. In the meantime we walked the surrounding hills which showed impressive outcrops of radiolarite and plenty of geodes in all sizes weathering out of the limestone substrata. On the terraced slopes one could study countless partly meter-sized geodes in varying states of weathering. From the inside of the broken druses white calcite gleamed like hoar frost. A vehicle-based search in this terrain was by no means practicable. One was happy to avoid capsizing the car on the steep slopes or to get stranded in one of the bottomless sand-filled gullies. With serious efforts and after several detours we worked our way back to the plateau. Late in the afternoon I handed over the driving to Pjotr in order to walk the last five kilometers to the find site which lay exactly north by northeast of our position. I left the GPS in the car, as the low standing sun in my back would be sufficient to keep direction. All I had to do was to simply follow my shadow. Zigzagging to cover as much surface as possible I marched towards the northeast across the windy Hamada. The exercise was pleasant, but on my walk I came across no suspicious stone whatsoever. After a little more than an hour I reached my destination. Despite the improvised navigation I missed the small stone pyramid, by which the find site was marked, by only hundred yards. It was good to know that in an emergency situation old school navigation was quite sufficient to get one through this terrain devoid of any landmarks. None of us had found meteorites that day and it seemed as if, apart from Pjotr’s two solitary finds, there would be nothing more to celebrate on this expedition. That night everyone went early for a much needed rest since our intestinal flora, which had been ruined completely on occasion of our visit to Sidi Ali’s Chicken Roastery, still took its toll. In a semi-somnolent state I overheard Roger and Pjotr rivaling about who was chasing the biggest scorpion. The only thing which worried me was the fact that their competition appeared to repeatedly focus around my tent. The next morning the two presented me their photos. As Roger put it, they had ‘in situ documented’, what obviously were full-grown specimens of the fat-tailed scorpion Androctonus, the “man killer”, as the literal translation derived from the Greek means. Only after our return did I learn from the relevant sources that the species of this genus were among the most toxic specimens which the complete order had to offer. Notably A. liouvillei reportedly seems to deliver an extremely unpleasant neurotoxin. The next morning, it was our third day on the Amwizirat, we decided to abandon the fruitless search for other masses of the achondrite. Fortunately there was no shortage of alternative targets. On the satellite chart I pointed out a small plateau framed by steep canyons on the southern edge of the Saquia valley. Since our topographic map lacked field and place names for many areas, I had assigned letters of the alphabet to preselected reference points. The plateau in question, which was part of the Grart Nwissiat as we later learned, was marked with the letter “Z”. Henceforth we spoke of it as the Zulu-plateau. It was declared our new target. The place seemed to exert an unusual attraction on us. Already during our first day on the Amwizirat we had tried to find a passage through the ravines to take us there, but we had turned back in the face of endless flint fields without having achieved anything apart from a punctured tire. This day, however, we were hell-bent on reaching Zulu plateau. On hairpin tracks along narrow ridges and through queds often blocked by drift sand we advanced towards our destination.